I’ve never written or said: “to such a great extent,” but hey, these people are so smart, I’m sure they know what they’re talking about. The Cambridge folks say so is a degree adverb that modifies adjectives and other adverbs—providing a splash of intense color, so to speak, a pretty girl wrapping a hot pink scarf around her neck, for example. So becoming. So, it happened again – twice in the past few days. I already told Facebook friends about the first time—took a quick tea break at work, looked up to see a Swainson’s hawk land on the security light above me. Just now, standing on my patio, a small hawk swooped across my garden, to perch on my navel orange tree. Went to see if it was a Swainson’s hawk, but it flew away before I could be sure. Hawks are beautiful, vigilant birds, but why now, why twice? Why me? I live in the city, for heaven’s sake. I’ve got way more to think about than the hidden meaning of birds – like washing socks or clearing the rain gutters of all these blasted leaves. Where are my work gloves and the ladder? So, besides being a visual gift, I still wonder if this unusual and repeated animal presence symbolizes anything? Seeking answers, I consult the modern-day Delphi oracles. I go online. 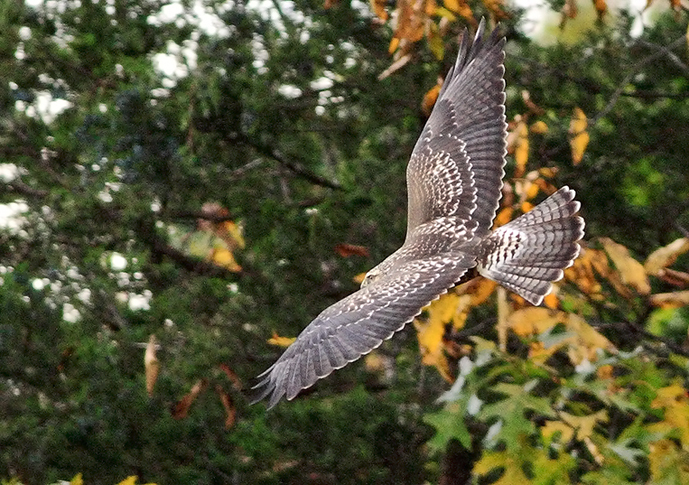 Internet shaman and soothsayers offer this: Hawks are messengers from the spirit world. They call on us to be observant, to look closely at our surroundings. Life is sending signals, things are changing and hawks tell us to pay attention so we can navigate the shifts. So, sitting in my jammies talking to you after a big holiday, apple pie crumbs on my chest, I wonder about flying, about looking down on the world, seeing everything in exactly the right place – hearts and hands, holidays and hurricanes. Then I remember I’m in California. We don’t have hurricanes. Hell, it hasn’t rained here in nearly three years. Maybe I should clean the garden rain gauge, all this hawk talk could be a sign. So, the Swainson’s hawk (Buteo Swainsoni) was listed as a threatened species in 1983 by the California Fish and Game Commission. The listing was based on loss of habitat and decreased numbers across the state. Either their numbers are increasing now or I’m very lucky to have not only seen one or two in the past few days, but also to have spent a good quarter hour with one — a young, light morph female. What messages do I need to receive? What has escaped my notice? Why do these sightings repeat? So, God, I’m waiting, listening with intensified attention.